Tom Boonen (Quick Step) sprinted to win the opening road stage of the 2011 Tour of Qatar in Al Khor Corniche on Monday, his 18th stage win in the race, and took the overall lead. Characteristic Qatari crosswinds whipped the bunch to pieces, allowing a large and star-studded escape group to gain a solid advantage over the main bunch containing prologue winner and race leader Lars Boom (Rabobank). Boonen, Gert Steegmans (Quick Step), Graeme Brown (Rabobank), Fabian Cancellara (Leopard-Trek), Mark Renshaw (HTC-Highroad), Juan Antonio Flecha (Team Sky), Daniele Bennati (Leopard-Trek), Jeremy Hunt (Team Sky), Heinrich Haussler (Garmin-Cervelo) and Roger Hammond (Garmin-Cervelo) were all present in the sprinter-heavy breakaway. Triple Tour of Qatar winner Boonen went out early in the final 500 metres, catching his fellow fastmen by surprise. Haussler followed Boonen home to take second, with Renshaw third. Brit Hammond finished in eighth spot. Boom came across the line in the main bunch some five minutes adrift of the leaders, his performance not helped by a stomach upset. Boonen took over from Boom at the top of the leader board. The Belgian leads second-placed Renshaw by four seconds, with Cancellara slipping from second overall to third, at eight seconds. 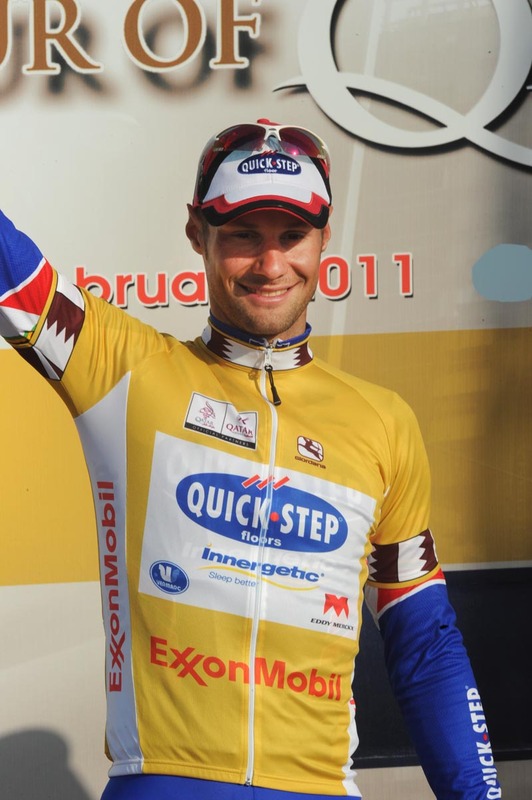 Boonen previously won the Tour of Qatar in 2006, 2008 and 2009. Mark Cavendish (HTC-Highroad) sat in the second of the two groups behind the leaders, still suffering from injuries sustained as a result of a crash during the prologue. The Manxman finished 12-30 down on Boonen. Hunt is now Britain’s highest placed rider in the general classification in ninth. Alex Dowsett, who started the stage as best young rider after finishing fifth in the prologue, lost contact with the second group on the road to finish in the same bunch as Cavendish, 12-30 down. On Tuesday, the riders face the second road stage in the six-day race, a 135.5km trip from Camel Race Track to Doha Golf Club. The race concludes on Friday, February 11.